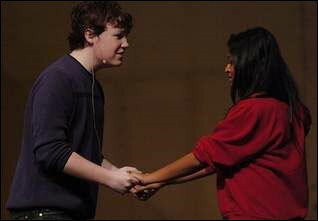 Novi High School students Joey Leppek (Schlomo) rehearses a scene from ‘Fame' with Tanaya Srini (Carmen). The cast of the musical ‘Fame' opens its show tonight at 7 p.m.
Fine arts programs often are the ones that suffer when districts look at cutting programs to save money. But Christina Hagen has seen that scenario play out far too often, and she was not going to let that happen in Novi. “I just wanted to come back and give back to the program that got me my start,” she said. 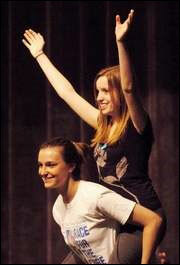 The students will be performing the musical “Fame,” which is about students at New York City's High School of Performing Arts. The show is set in the 1980s and touches on issues that many students continue to face today, such as prejudice, sexuality, substance abuse, achieving their goals and more. It opens April15 at 7 p.m. and also will be performed Friday and Saturday at the same time in the Novi High School auditorium. Hagen said the musical's theme is about how important the fine arts are to students, so the cast has had an easy time relating to the characters. It also has been a great opportunity for her and fun for the kids to work with someone who has worked professionally, she said. The cast is made up of 44 members, a dozen students in the orchestra pit and about 10-20 students on the production side. Leads are spread out among 14 main characters. Tanaya Srini, a junior at the high school, is performing in her first ever musical and will be playing Carmen. She said she is excited and a bit nervous to step on stage tonight, but expects the audience to really enjoy the show. This is the high school's only musical of the year. Tickets can be purchased at the door and are $10 for adults and $8 for seniors of 65 and children under 12.